Overlapping codes: Becky Brown and Annette Cords Studio Visit. | The Bottom Line "The Drawing Center"
Overlapping codes: Becky Brown and Annette Cords Studio Visit. Becky Brown studio entrance; photograph by David Anaya Maya. A handmade white sign contrasts with a brown doorframe. It is a building number from an avenue, but it is placed directly on the street: 1950. This is a nomenclature, this is a date, this is a reminder of the arbitrariness of the world of signs. 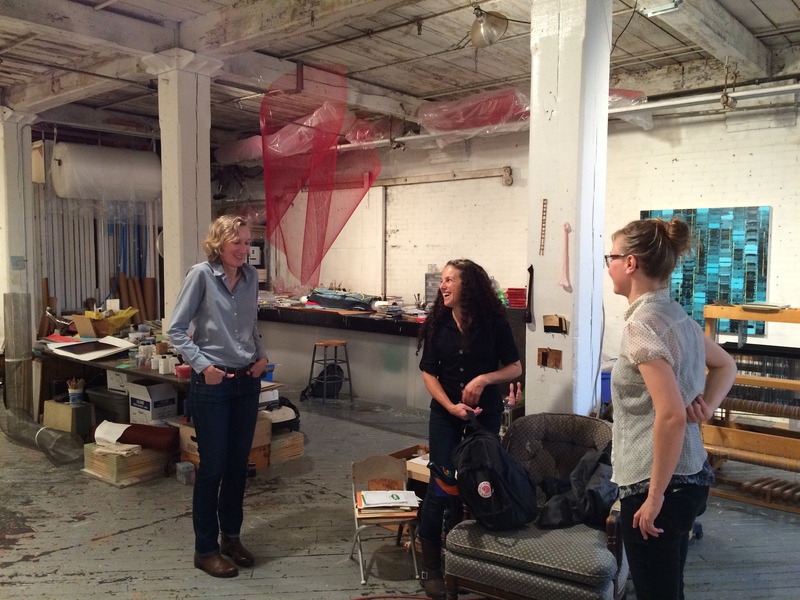 We reach Becky Brown’s studio floor and meet her. She leads us through another door, to a hallway. Then we go to the right, then to the left. We come into the studio and she hands us one of her small artist’s books. I flip through it and discover a red ink drawing made of the words “SYMMETRY” and “LABYRINTH”. It seems to me a fitting description of the space we’re in. Lisa Sigal, curator of The Drawing Center’s Open Sessions Program, opens the dialogue by discussing a large work on paper. It seems to establish a peaceful relationship between whimsical geometric shapes and several provocative quotations. Signs and shapes coexist in space, half organic, half reticulated. Brown’s subtle, gently-caused misunderstandings then produce new meanings. As we walk around the studio, I notice that the works subsume the role of text as the driver of meaning, allowing drawing to create a visually overlapping language. The coexistence of several layers of meaning in each piece makes me think about the forces that constantly vie for our attention and struggle to rule our perception in our daily lives. Exploring drawings, collages, and objects around the studio, we have the chance to experience overlapping “modes of communication,” as Brown puts it. Indeed, her studio is full of encounters between figures, images and words. In this place, there is no way to ignore the boundaries of our modes of communication and their fragility. The studio helps us to learn about another kind of syntax, which is potentially capable of transmitting another kind of information. 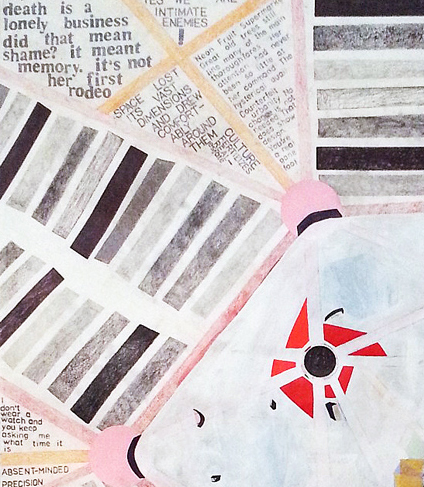 Brown utilizes a diverse compendium of languages as if it’s just another material that makes up her work; several techniques circulate in her practice in the same way that she circulates the tools in her studio. Here, she overlaps techniques and languages, deciphering modes and crossing borders between meanings. 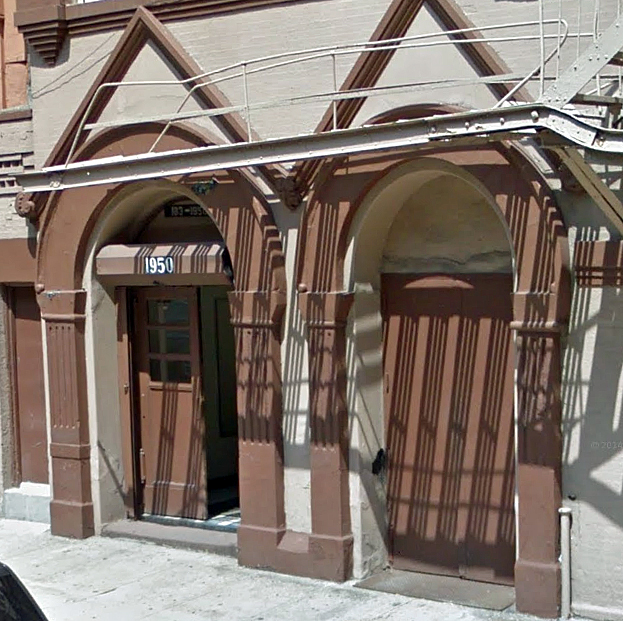 We easily find the building that houses Annette Cords’ studio, but we miss the main entrance. Maybe we were not paying enough attention — the building address is big enough, and placed over a metal door. It’s closed, so it looks strong, safe, hermetic. There is a door phone but we don’t know the number of the studio. I start dialing random numbers, hoping to find someone who can help. A man answers the phone, but he has no idea of the artists’s studio floor. He suggests we go inside the building, since there is a big open door just a few steps further down. We laugh. We step inside the building and try to find the elevator. There seems to be no such thing, and no stairs either, only closed doors. But wait! There is a button! Actually, it is an old fashioned buzzer. It is a very old elevator. The lift man hears the ring so he operates the elevator. We’re unconsciously being introduced to the space of an artist interested in codes. Without really knowing it, we have been deciphering codes, as we struggle to reach Annette Cord’s studio. The lift man doesn’t know the numbers of the artists’ studios, so we knock on each door asking for help. Fortunately, we finally find Cords’ phone number, so she came to find us. We decoded a key code. Finally inside, we talk about the charming atmosphere of this studio. I’m here with Lisa Sigal and Nova Benway, Open Sessions curators at The Drawing Center. “This is the kind of studio the artists of New York used to have,” somebody comments. A big old industrial space that is somehow still comfortable and rustic. The woven structures hanging on the wall don’t wait long for our attention. The strength of the visual marks and the residual traces that the artist uses as resources for her work, create a meaningful constellation able to challenge the viewer, capturing the mind, encouraging it to decode the signs. Making us feeling closer to the abyss of misinterpretation, these works powerfully instigate us to identify the worlds that these languages come from. 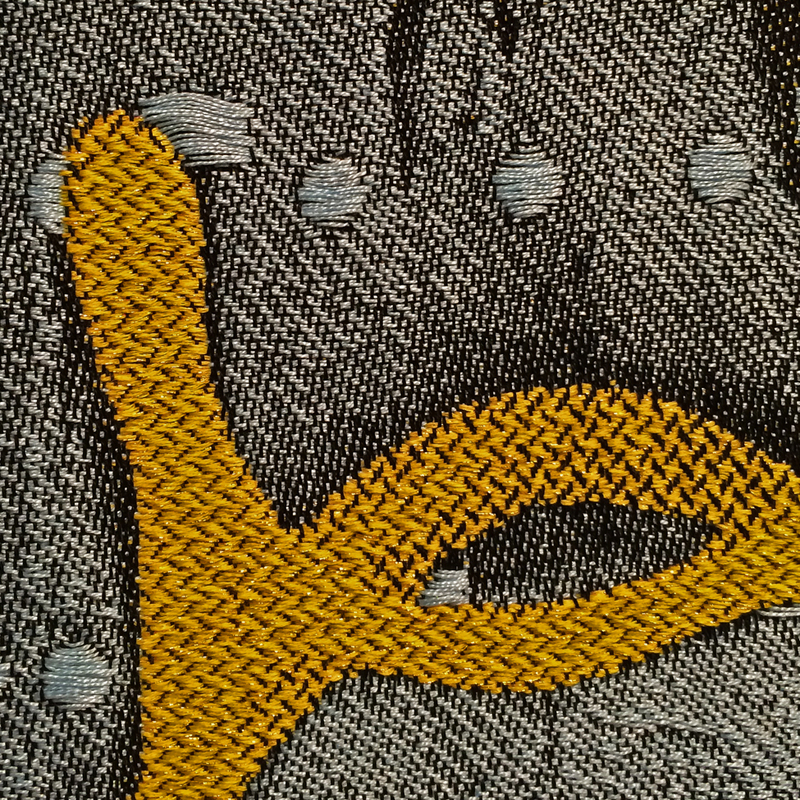 There are many worlds overlapping each other in these images, which are made of Jacquard. Planets, graffiti, street tags, traces of decaying subatomic particles — having a conversation in the language of the wool or of the thread. Textures, colors, rhythms and patterns coexist and crash in this work, autonomous languages spreading content and meaning on the surface. Layers of stories and histories becoming part of our visual world. The work of both Brown and Cords contain overlapping codes. The techniques the two artists use are significantly different, but the capacity to gather sources is outstanding in both practices. The risk of getting lost while looking for a meaning in a sign is a pleasure in these studios. Although both artists employ distinctive languages, they are capable of throwing away mental boundaries as well as the limits of the recognizable.